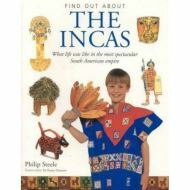 Discover the spectacular world of the Incas and their ancestors. Uncover the secrets of the mummy bundles, the mystery of the giant lines in the Nazxa Desert and intricate rope bridges high in the Andes Mountains. Projects actively involve the reader in the past. Try making a reed boat, an Incan drum or design a tunic fit for an emperor. The "Find Out About" series presents exciting and educational information that takes young readers back to times past. Facts and practical projects help children understand the peoples of early history. Each book is illustrated with colour photographs, a historical map and pictorial timelines.